Spectra Group’s SlingShot has been selected to participate in the U.S. Army Expeditionary Warrior Experiments (AEWE 2019). Spectra Group is an international specialist provider of secure voice, data and satellite communications systems, specifically optimized for use in remote and challenging environments, with offices in the UK and the USA. 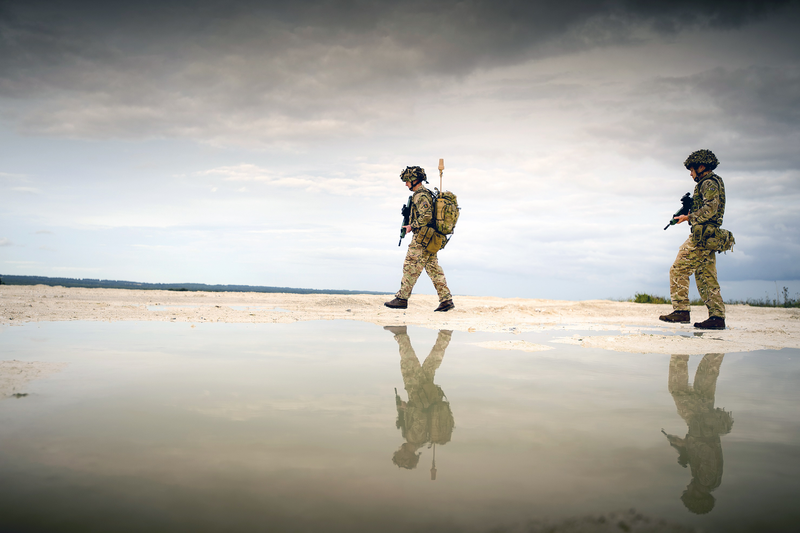 Following recent contract successes in the U.S., particularly with their battle-winning SlingShot tactical communications system, Spectra Group (US) Inc. has been selected by the U.S. Department of Defense (DoD) to take part in the 2019 Army Expeditionary Warrior Experiments (AEWE 2019) at Fort Benning, Georgia. AEWE is the U.S. Army’s premier venue for small unit modernization, providing capability developers, the Science and Technology (S&T) community, and industry with a repeatable, credible, rigorous, and validated operational experiment, supporting both concept and material development. The AEWE is an annual campaign of experimentation to place cutting edge prototype technologies into the hands of Soldiers to solve small unit tactical problems. The Maneuver Battle Lab, as part of the Army Futures Command (AFC), executes AEWE to accelerate near and midterm Army modernization and provide bottom up input to capability development, by providing early and iterative feedback on prototypes in a tactical setting. 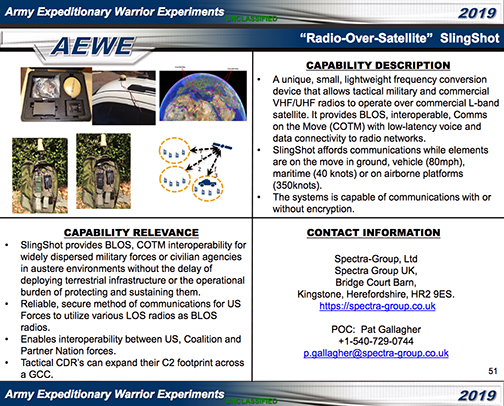 AEWE is the “first step” of a larger Army and Joint Experimentation enterprise. Being demonstrated at AEWE, Spectra’s SlingShot adds voice and data BLOS COTM (Beyond-Line-Of-Sight Communications-On The-Move) to in-service tactical VHF and UHF radios. In addition to standard voice and data C2, it can enable capabilities such as remote biometric analysis, fire mission planning, tracking and inter-agency operations. Man-portable, vehicle, maritime or aviation-borne, usable on the move, delivering flexible channel leasing and with minimal increase in training-burden, SlingShot redefines tactical communication capabilities. Simon Davies, President of Spectra Group, sai, this is an important and prestigious step for Spectra Group to be selected to take part in the US AEWE 2019. The company's SlingShot system is already in service with the world’s premier specialist forces and it has been battle-proven on multiple occasions. AEWE will provide an excellent opportunity to show case SlingShot’s unique, widespread, operational capability which is attracting increasing attention from the Security Force Assistance Brigades, Brigade Combat Teams, FORSCOM, and indeed USMC and NG.